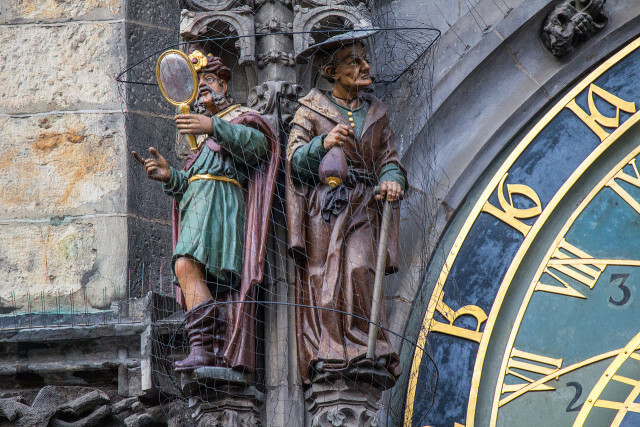 Legends tell us how Prague’s famous Astronomical Clock was created. It is one of the most compelling landmarks in the capital city of the Czech Republic. The most widespread legend of all dates back probably to the 15th century, around the time the clock appeared. It says that an experienced clock master, known as Hanuš, was selected by the city councilors of Prague to produce an original device that would not only measure the time but also have a few other functionalities. However, the councilors were worried about whether Hanuš might produce another, similar-looking clock for another city. Which is how they started thinking of ways to eliminate any such possibility, and eventually they came up with a sick plan. One night, they sent people to break into the home of the clock master to injure his eyes with a chunk of iron, leaving him blind. It was not that Hanuš couldn’t figure who committed this wrongdoing, so in revenge, with a little help of his apprentice, he went to his creation and made the clock halt. As the story goes, over 100 years passed before the clock was brought to life again. Like many other versions of the legend, this one attributes the clock’s craftsmanship to the wrong person. 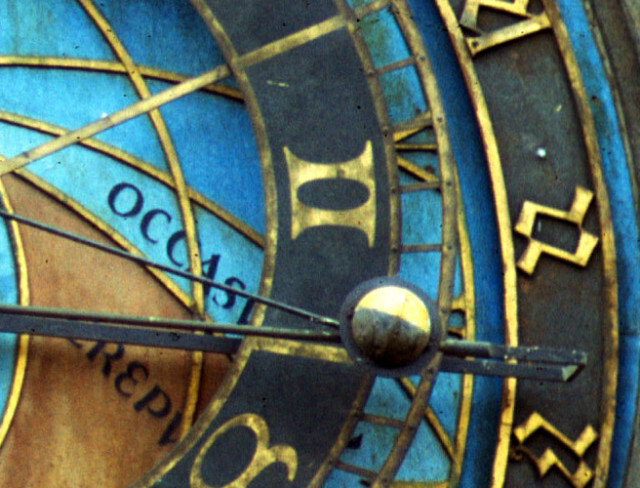 According to a paper that contains an insightful description of how the clock’s astronomical dial works, discovered in 1961, the creator was the Imperial clock-producer Mikuláš of Kadaň. He devised the piece in 1410, helped by astronomer and university teacher Jan Sindel. 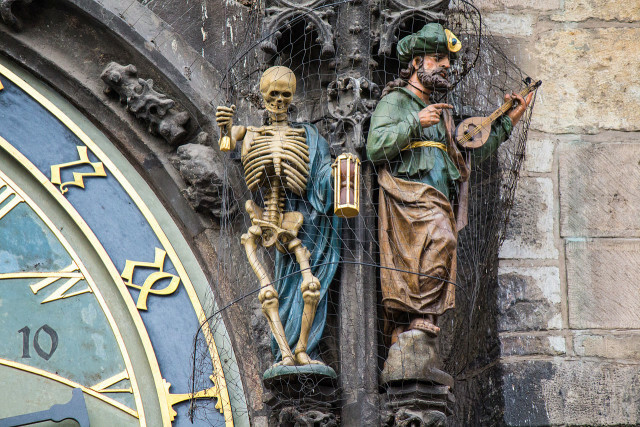 On a few occasions during its history, the machinery of the Astronomical Clock has failed. Therefore, the device needed to undergo maintenance. No one knew how to fix it though, so when the clock stopped sometime during the late 18th century, local officials even considered replacing it with another piece. Luckily they didn’t, but for an extended period the device was simply not working. The long-needed repair came many decades later, around 1865, when one of the clock’s newest features was added, the Calendar Dial. 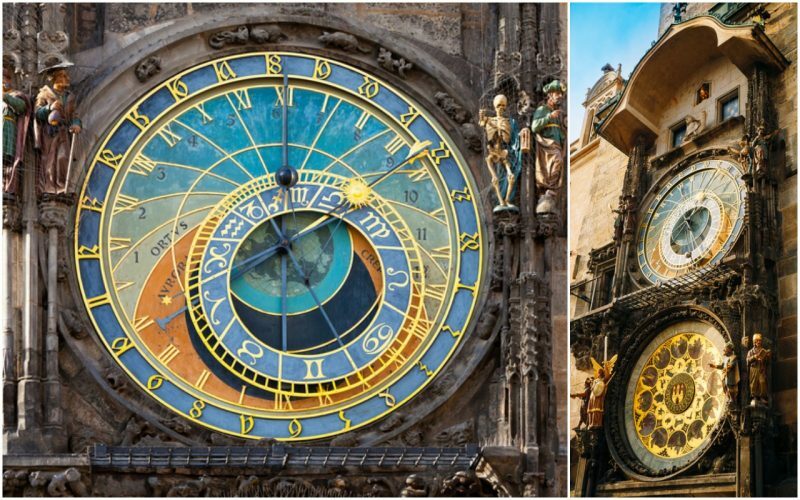 It is one of the most famous clocks around the world, but it also makes for the third-oldest astronomical clock and the oldest one still in use. 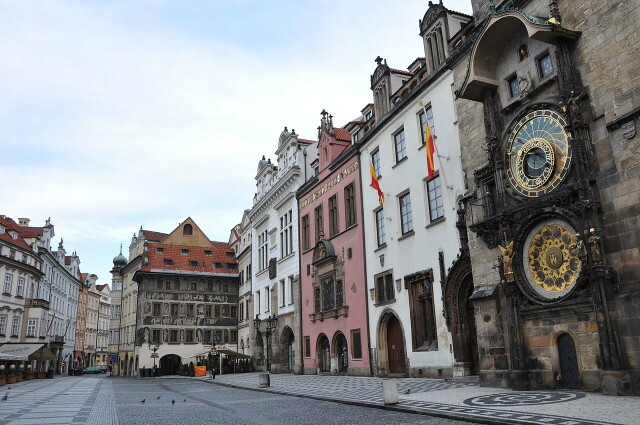 Its age and authenticity are some of the reasons why people gather each hour in front of the Old Town Hall Tower where the Astronomical clock wisely sits, to watch how it chimes the hour, an experience that lasts just 45 seconds. When it does chime the hour, the window of the clock in the upper part shows the 12 apostles moving. Simultaneously, the surrounding sculptures that adorn the device are set in motion. One of the moving figures carrying an hourglass in his hand personifies Death. Another moving figurine has a mirror, representing Vanity. Other figurines, such as those of the Astronomer, the Philosopher, or the Chronicler, appear to be motionless. However, several of these figures are replicas because their originals were severely damaged by the Germans at the end of World War Two. 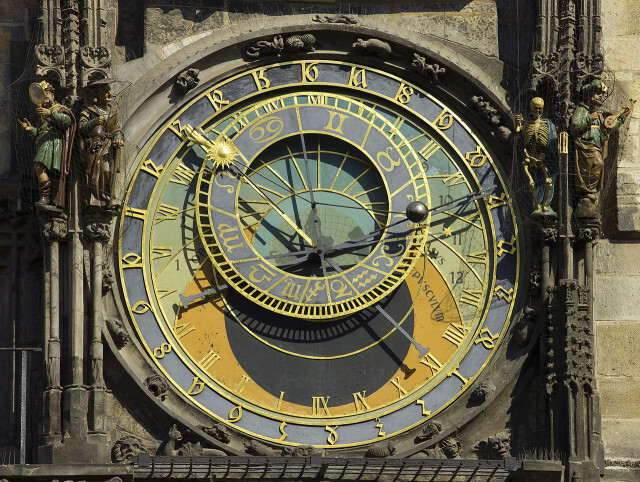 The Astronomical Dial is probably the oldest of all clock components and is one of the main reasons why the Prague clock is so unique. This element splendidly illustrates how people of the medieval era observed the universe. Of course, it is the Earth represented in the center of it. The dial’s bits of blue stand for the skies beyond the horizon, while a brownish counterpart stands for the skies below it. Inscribed Latin letters further indicate which side is east and which one is west; north and south are in this case replaced by denotations for “above” and “below” the horizon, both marked with Latin words for “dawn” and “twilight” respectively. A zodiac circle stands for the stars up above and it runs in harmony with them, and the two clock hands display the symbols of our closest stellar bodies, the sun and the Moon. The three sets of this dial can count three different times. The first is the Italian time or what would be Old Czech time. Central European Time is measured by the sun pointer and this is the hour, from 1 to 24, which the clock chimes. It was once set to measure Old German Time, but before that it counted the hour according to Bohemian Time. The third is likely the most interesting of all sets, measuring Babylonian Time where the hour’s length is determined by which season of the year it is. During summer the hour is longer; in winter it’s shorter. This device is the only clock one on the entire planet known to be capable of tracking Babylonian Time. 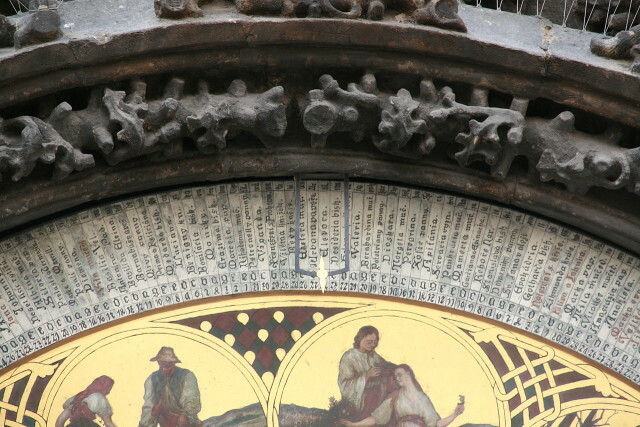 In comparison with the Astronomical dial, the Calendar one has fewer functionalities, but it is brilliant anyway. 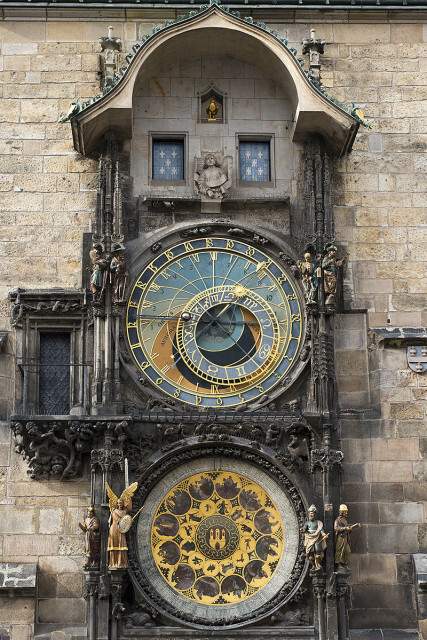 In its center, it shows the symbol of the Old Town of Prague and its outer ring reads the description of each day for all year round. The current day is shown at the very top. 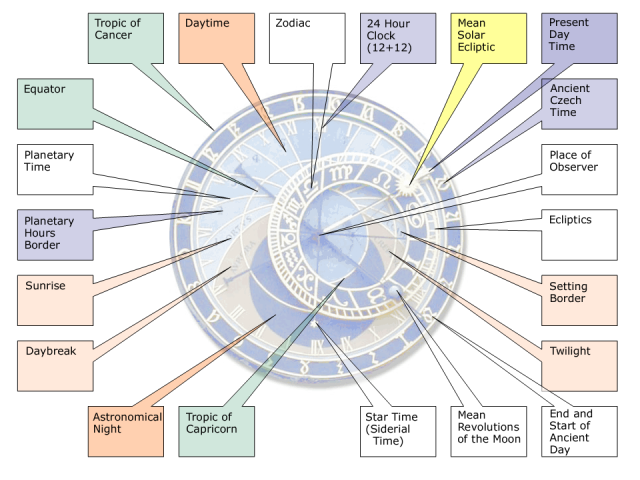 Each month is also represented by a zodiac sign situated in a medallion. Little did we know there were so many ways to measure and represent time.